IP address connection restrictions - where are stored? Hi, where are stored the "IP address connection restrictions " for SMTP Connector? I Should insert many IP and with MailEnable Management is too slow! I checked in \Mail Enable\Config but files arent synced with MailEnable Management and arent updated from years . Re: IP address connection restrictions - where are stored? The file where the IP access control lists stores the denied IP's is in SMTP-DENY.TAB. However if you have stored the MailEnable configuration within an external database then this will be stored in a database table and thus would explain why you don't see the modified date changing on the .TAB file. 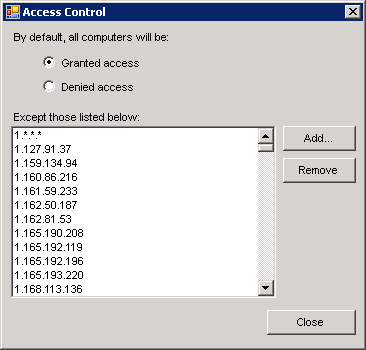 Which table (on a Microsoft SQL Server) contains the blocked IP addresses from the SMTP Access Control List? blocked IPs will have a Mode of "1" Status of "1" and AcccessRight of "CONNECT"
Providing World Class Hosting Solutions for over two decades.